Sonoma Library Music Series a Success! •Standing Ovations Lead to New Funds A.F.A.R. Host Charles Sepos chats first with Pacifica String Quartet violist, Masumi Per Rostadt. 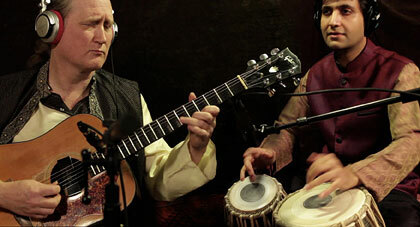 Next, world guitar pioneer Matthew Montfort talks about his musical life and about his world fusion group, Ancient Future, and their appearance August 30th at Gaia's Garden in Santa Rosa. 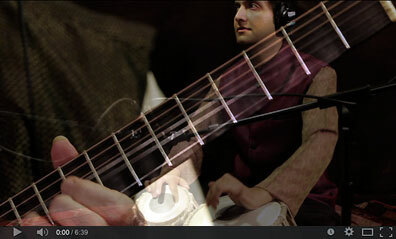 The interview ends with a preview excerpt of a soon to be released live concert featuring Vishal Nagar (tabla), Matthew Montfort (scalloped fretboard guitar), and Jason Everett (bass). Listen to the archived show on iTunes or feeds.feedburner.com/KRCBCurtainCall. 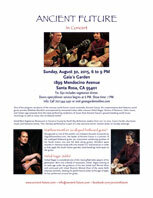 World fusion guitar pioneer Matthew Montfort and tabla virtuoso Vishal Nagar finish their series of North Bay concerts with this vegetarian dinner concert at Gaia's Garden in Santa Rosa. This concert will also feature a special guest or two, definitely including composer and santurist Mariah Parker! Voted Best Vegetarian Restaurant in Sonoma County by North Bay Bohemian readers from 2011 to 2015, Gaia's Garden also hosts music and literature events. This intimate performance is part of a new exclusive dinner concert series on Sunday evenings when the restaurant is normally closed. Adm: $30 includes vegetarian dinner. Gaia's Garden features an international plant based buffet with vegan and gluten-free options. Included in the ticket price are two entrees, as well as all-you-care-to-eat salad, two soups, Lundberg's eco-farmed brown rice, a mild curry, non-GMO polenta, marinara sauce, roasted vegetables, steamed rainbow vegetables, house-made loaf bread and corn bread, house brewed uncaffeinated chai or iced hibiscus tea, and two desserts. Beers and wine, as well as organic French press coffee and a variety of teas and soft drinks are available for purchase. Free parking is available in the lot behind the building. Standing Ovations Lead to New Funds A.F.A.R. The heartfelt standing ovations for Matthew Montfort and Vishal Nagar at both recent Sonoma County library concerts led to new financial supporters for the Archive of Future Ancient Recordings, Ancient Future's fan funded recording project, bringing the archive to 17% of its funding goal! The archive has more than an hour of music in it so far, and more than twenty additional minutes has been recorded, mixed, and mastered! While we are arranging for licensing Ancient Future's very unique cover of a popular song as well as new live versions of Ancient Future compositions from the band's major label days with three different rights agencies, supporters of the archive can purchase a limited edition CD of all of the tracks already in the archive, appropriately titled A.F.A.R. So Far. Because the archive soon will not fit on a CD, the next A.F.A.R. CD offering will be The Best of A.F.A.R. So Far and won't have all of the tracks that have been added to the archive, so this is the last chance to get one of these CDs, on sale at only $15! Please become a supporter at one of the levels below, starting at just $15. Once you become a supporter at any level, you will receive all of the tracks in the archive (and all of the tracks that will be added in the future), and you will be eligible to buy the CD-R. The Globe Sound Healing Conference aims to provide a venue for sound practitioners, the public, and the medical community to meet and form connections and alliances. Ancient Future will be performing on the bill at the festival's Sound Garden Main Stage Concerts on the spectacular garden roof of the Kaiser Center Tower. 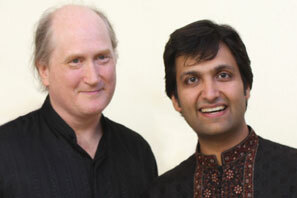 The concert features Matthew Montfort on scalloped fretboard guitar and Ferhan Qureshi on tabla. Adm: $25 adv. until September 9 at soundhealingcenter.com. $30 door. Includes all exhibits and Sound Garden access.